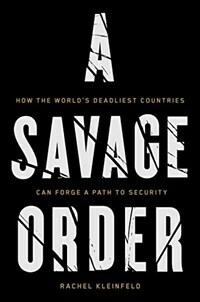 An urgent, provocative examination of how violence can cripple democratic societies and institutions and what nations can do to successfully establish peace within their own borders. Crime exists in every democratic nation on earth, but in some places, it runs rampant, shaping every aspect of civic life. A False Peace investigates why and how some places, riddled by inept government and states, are able to recover. Drawing on fifteen years of both academic and firsthand field research--interviewing generals, former guerrillas, activists, politicians, mobsters, and law enforcement in countries around the world--Dr. Rachel Kleinfeld documents the unambiguous measures that societies have taken to empower the strong civic movements, governments, and institutions that protect countries and mitigate atrocities that damage people's lives. In this powerfully argued and timely book, Kleinfeld takes on existing literature and popularly accepted theories about foreign aid and intervention, making clear exactly why it's crucial that we understand what makes some countries peaceful and others war zones, and what we can do about it.